Fast Forward Weekly is a progressive newspaper distributed to 1,300 coffee shops, restaurants, stores, and other locations around Calgary, Alberta. 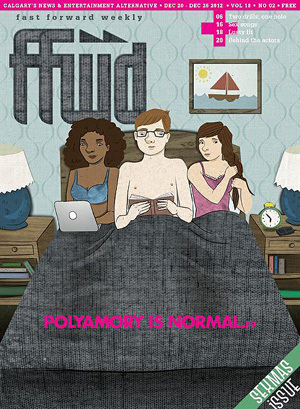 A couple weeks ago, a story on polyamory made it to the cover, along with the words "POLYAMORY IS NORMAL." 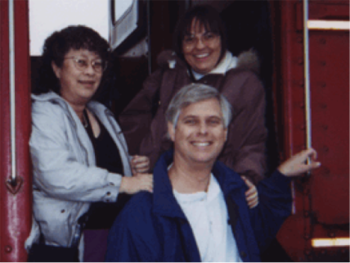 The article, entitled "It takes more than two," profiles several poly folks from Calgary and includes a few quotes from a Calgary sexologist. Making room on his calendar for three people is a challenge, Shiels acknowledges, but he disputes the common argument that, love being a finite commodity, polyamorous people will inevitably get less of it from their partners. Finding the time for his partners may be difficult, but finding the love isn't. "Sometimes I use the analogy of, if I were to have only one child, that would be great, I would love that child unconditionally and unreservedly -- but if I had three or four children, would that change anything? In fact, I would say I'm blessed even more for having that much love and dynamic in my life." Read the rest at Fast Forward Weekly.